Santa Barbara City College helps with many of the Quire’s needs (such as rehearsal space and Nathan’s salary), but we depend heavily on the community for many other things needed to continue operating. Donations cover venue rental (which has skyrocketed in recent years), the cost of SBCC tuition for singers (likewise), audio needs, printing, publicity, administrative help, and other costs. (All donations are tax deductible.) For volunteers at concerts, the Quire relies–gratefully–on its beloved Guild. We would be grateful for your contribution, in whatever form. To donate by mail, send your tax deductible donation to Quire of Voyces, SBCC, 721 Cliff Drive, Santa Barbara, CA, 93109. To donate online, follow this link link to the SBCC Foundation website and type “Quire of Voyces” where it asks for special instructions to accompany your gift. To donate by phone, call the SBCC Foundation 805-730-4401. 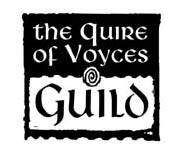 Learn about the Quire of Voyces GUILD and how you can help with concerts and publicity.